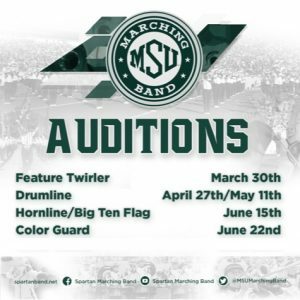 The 2017 Spartan Marching Band Feature Twirlers are Nicole Harris and Taylor Scheffer. Senior Nicole started twirling at the age of 5 and has been twirling for 16 years. 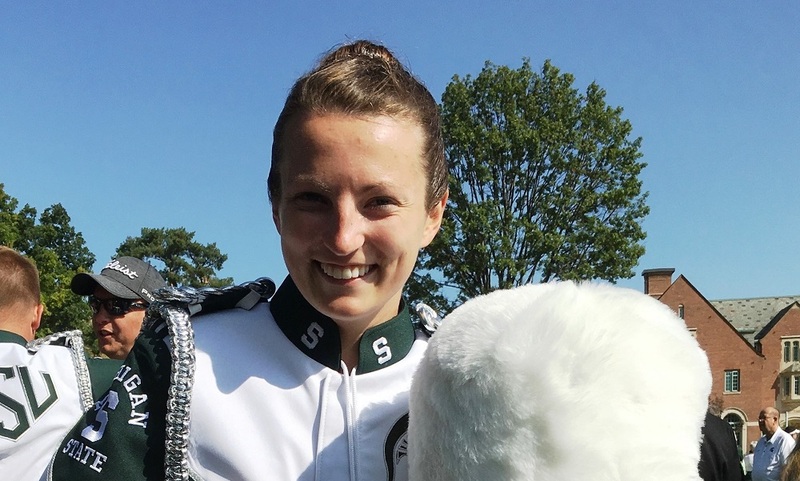 Sophomore Taylor started twirling at the age of 9 and has been twirling for 10 years. Both women are members of the Twirl-M’s baton twirling group out of Walled Lake. 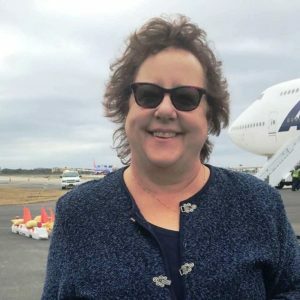 Rhonda Muscaro, along with various other coaches, have instilled their love of baton twirling from a young age. Nicole and Taylor have competed on the same team winning More than nine national titles. Each summer, the twirlers train every day in preparation to compete at the baton twirling national championships held at Notre Dame University. Once they return, they immediately head right into preseason training for the SMB. smb twirlersThe twirlers started off preseason this year teaching Taylor the traditions of the previous feature twirlers. 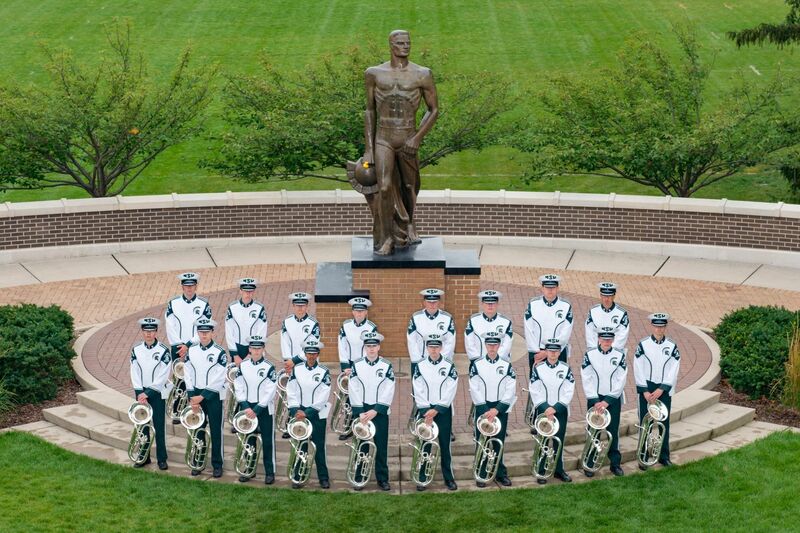 These traditions include the fight song, pregame, and series. 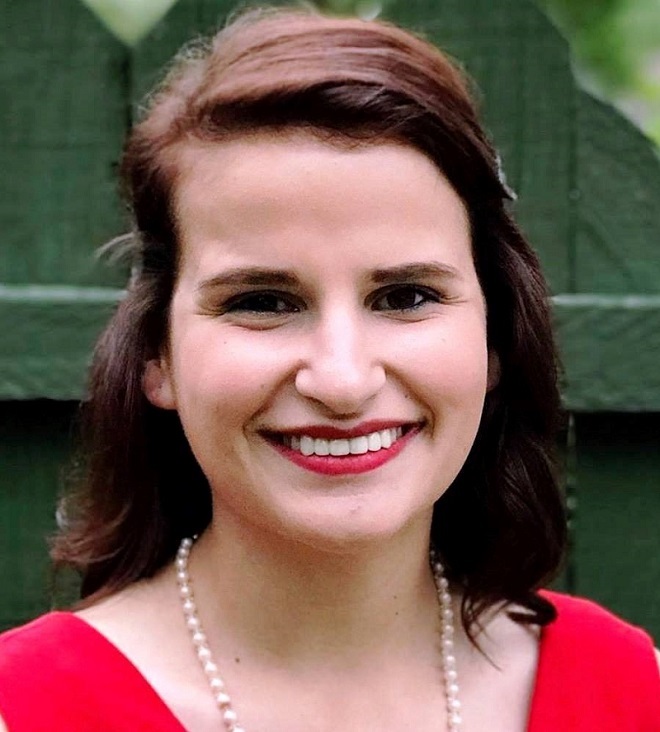 These are traditions that the feature twirlers hold dear to their hearts because they have been passed down from generation to generation starting in 1972. The most unique aspect of the feature twirler position is having the ability to choreograph their own routines for halftime and postgame shows. The twirlers have multiple sections that they create at the beginning of the season, and throughout the process of learning halftime, they mix and match the sections to create a combined routine. The routine changes every week and includes 1, 2 and 3 batons. 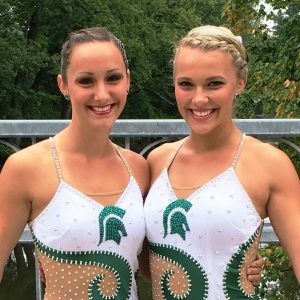 Although choreographing individual routines is exciting, the best part about being a Michigan State feature twirler is getting to twirl with one another. At the start of every season, the feature twirlers create a duet or multiple duet routines that they will perform throughout the season. Both Nicole and Taylor found this to be an extremely easy process because of their long history of twirling together. Both girls describe themselves as having the same twirling style and process of choreographing. 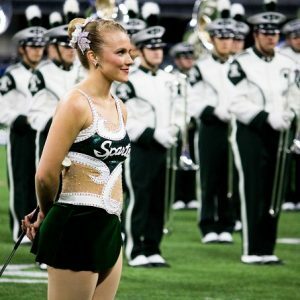 This is a bittersweet year for Nicole as it is her last year with the SMB, but for Taylor, her journey just began and she is excited to carry on the traditions. 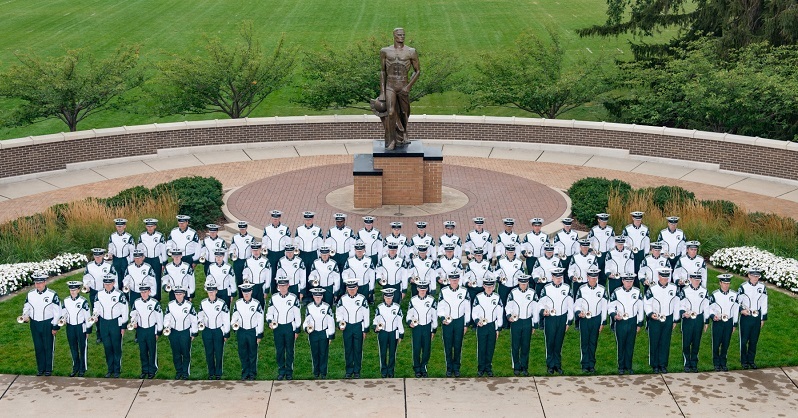 The Spartan Marching Band trumpet section is the biggest section in the band, standing at 59 members for the 2017 year. 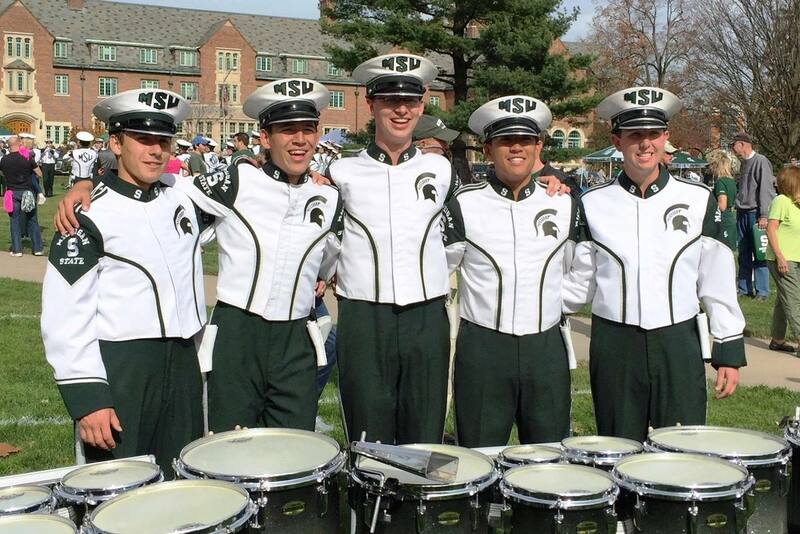 The three trumpet section leaders, fifth-year senior Peter Richey, senior Bradley Arnold and junior Shannon Sheldrick, are joined by 11 other squad leaders: Lindsay Culp, Joey Swinkey, Richard Lewis, Alex Burns, Jacob Bonesteel, Adam Johanknecht, Emily Garman, Jake Bronson, Kyle Hanson, David York and Michael Perry. 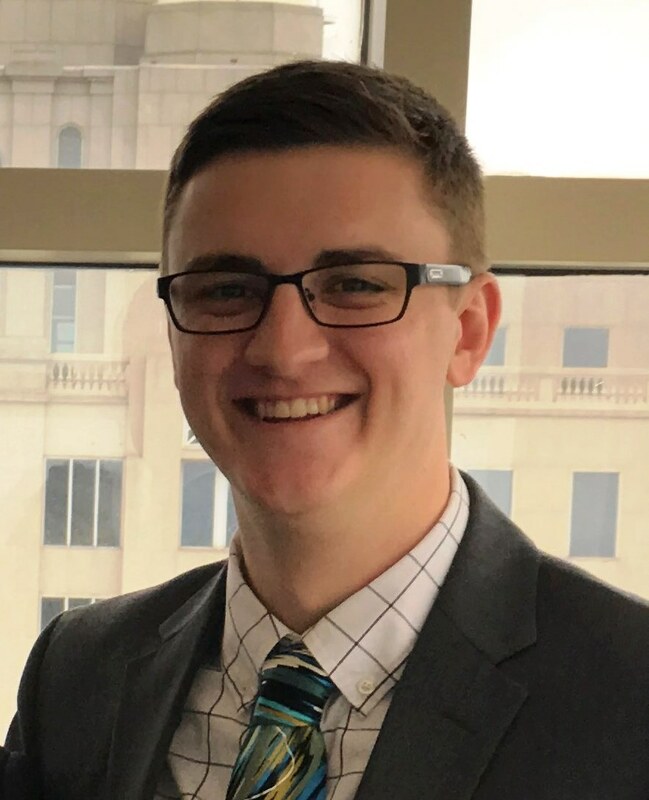 The top eight players in the section are chosen to play the E-flat cornet, more commonly known as the “eeph.” The eephs have their own traditions, including their own Series and “Eeph Games,” which you can observe on game days when the band is in arcs on Adams Field. 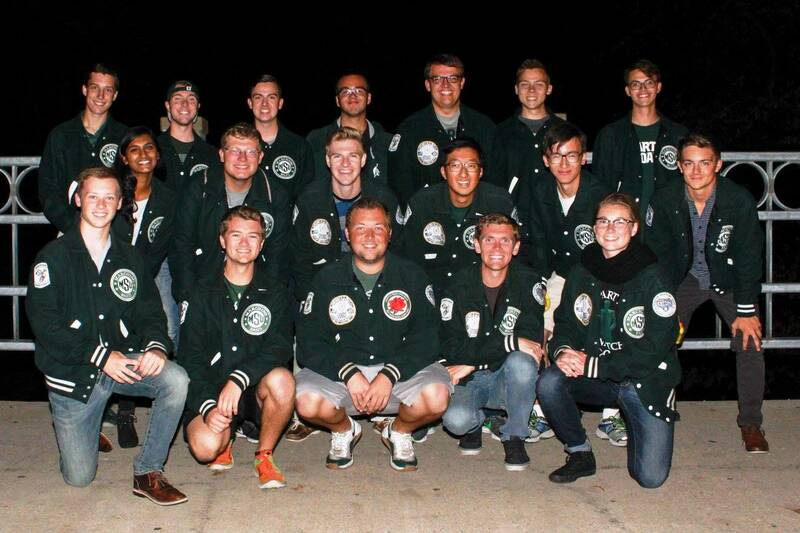 Being such a large section, it can be difficult to bond, but the trumpets make sure to do so through a few group outings throughout the season. 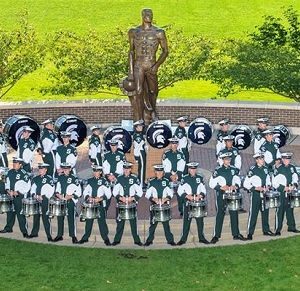 Every year to celebrate the end of preseason, they take a trip to Cracker Barrel and then go to IHOP after the Spartan Spectacular rehearsal in late October. Additionally, they go to Uncle John’s Cider Mill for cider and donuts during the fall. 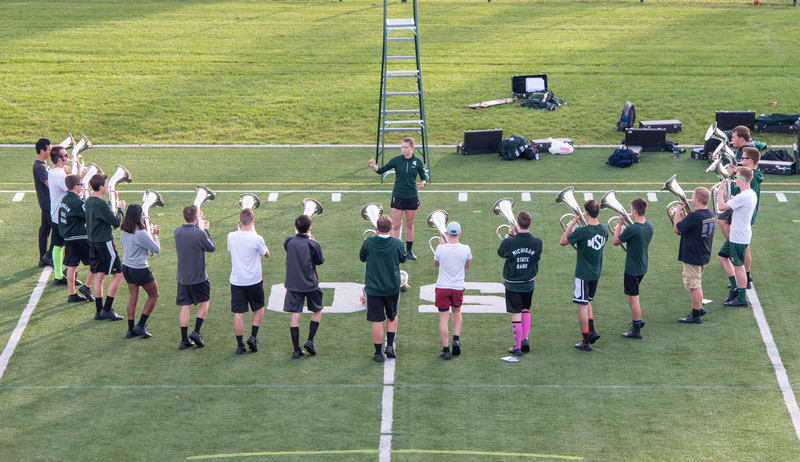 The trumpets also have some very serious traditions, including playing “MSC” – Michigan State College’s original alma mater – on Adams Field before our march to the stadium. 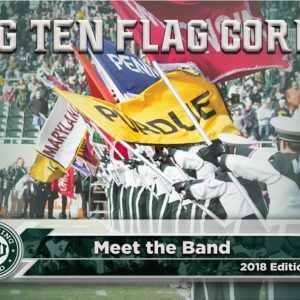 It is one of their most prevalent customs because it is a great way for the listeners as well as the players to remember some of the history behind the Spartan Marching Band, as well as to reflect on how far we have come. The trumpet section includes many different personalities, but one thing is for sure: they will always be sure to greet you with a friendly “Hullo!” should you come across them. On gamedays, seen from afar in sectionals on Adams field, the Mellophone Section can be distinguished from the pack as it huddles and chants three times, “Spartan Mellos/ Brass Playing War Machines/ Trained to Fight, Trained to Kill/ Trained to Die, But Never Will!” For the record, they wouldn’t hurt a fly. 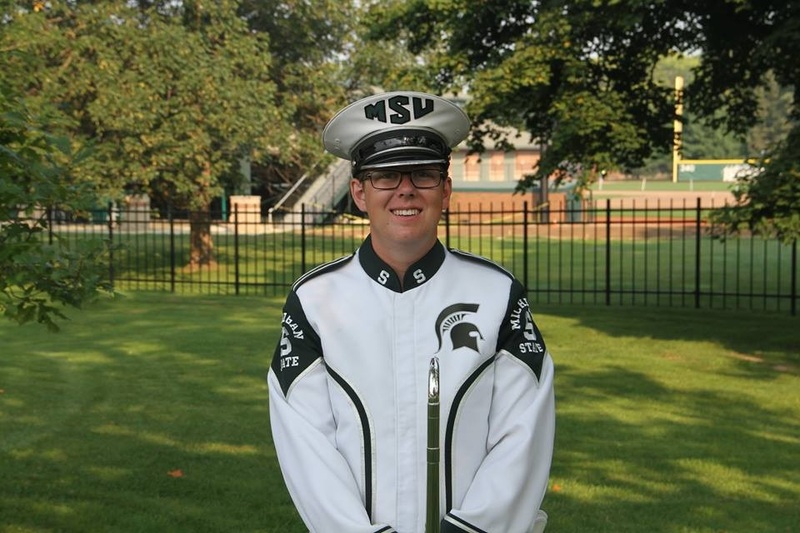 This mantra exemplifies the passion, intensity and drive with which each of the 26 Mellophones approach performing with The Spartan Marching Band. 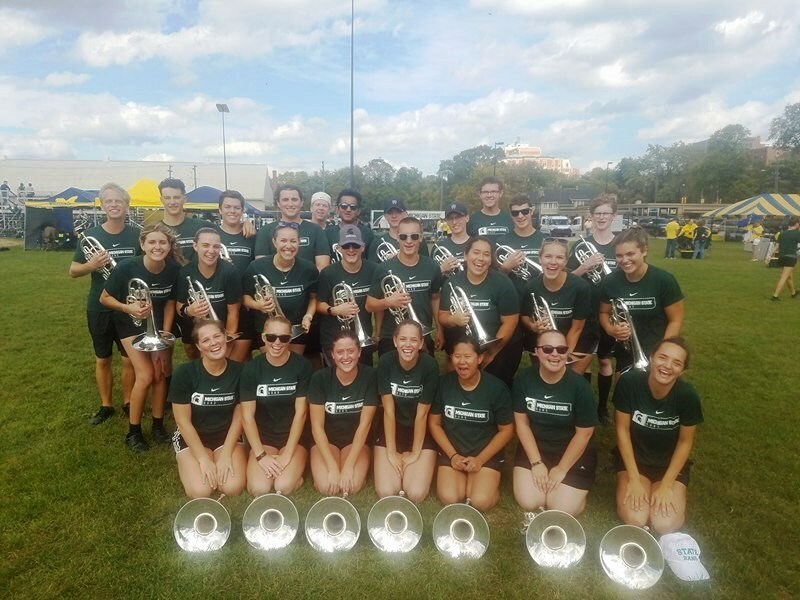 Comprised of 8 new members and 18 veterans (specifically, 4 fourth years, 4 third years, 10 second years), the Mellophone section has one of its youngest sections to date! 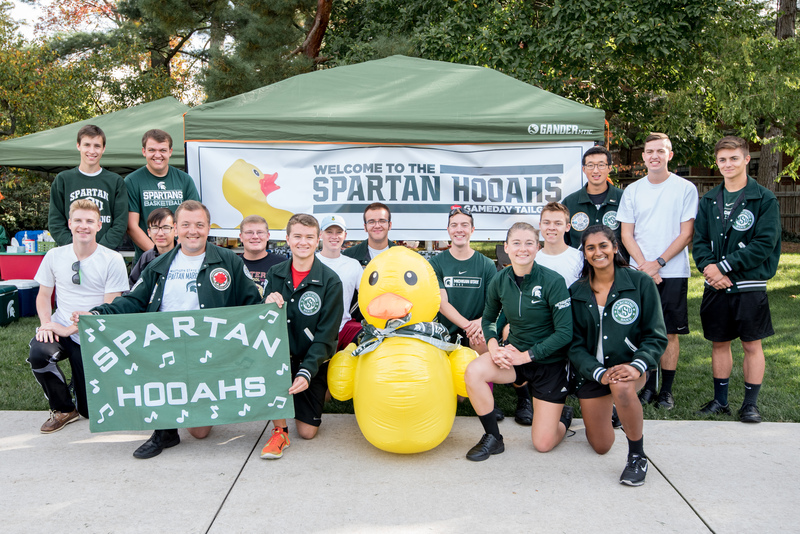 Led by section leader Hannah Trezise, the Mellophones also boast outstanding squad leaders in Justin Hoffman, Kelsey Ordway, Steven Hogan, Hanna Sajdak, Sarah Hughes and Joseph Essenburg. Unfortunately, the origins of many Mellophone traditions have been lost to history. 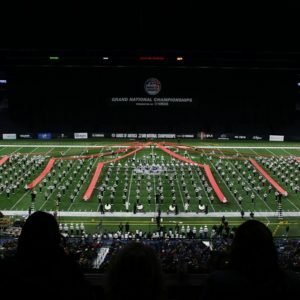 Nevertheless, the section is incredibly proud of everything that sets them apart from the rest of the band. 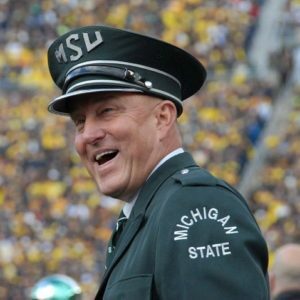 For example, along with the Mello chant, one can also catch the Mellophone line– arranged from tallest to shortest member– playing pregame fight… but on the person to their left’s horn. At the last in-season rehearsal of the year, the Mellophones also partake in the cherished tradition known as “Primary Instruments Day.” Originally created as a means to remind the band’s fans of what a French Horn looks like, the event has become something of a chaotic gathering of instruments and non-instruments (IE: frying pans and wooden spoons) with which they perform the attendance block’s Falcone Fight. 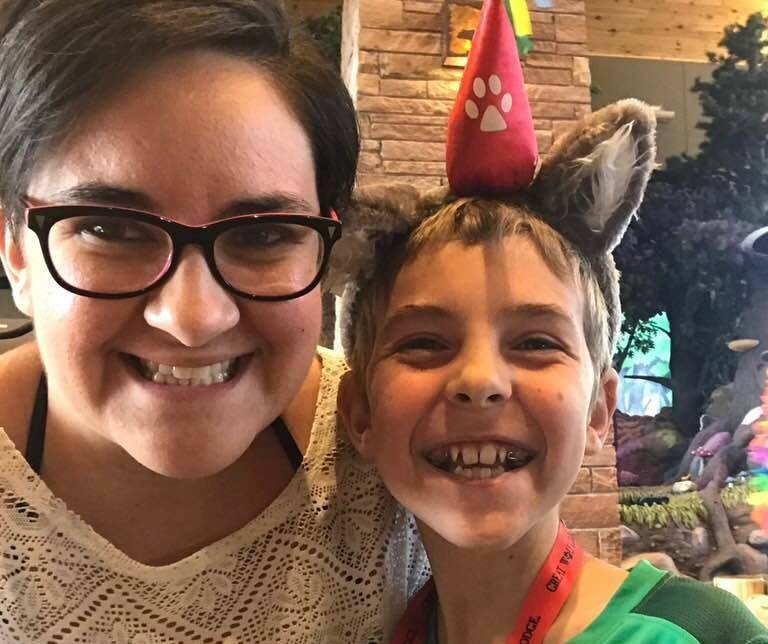 Other, smaller traditions include White Mellophant Gifts, pillow pets, a widely recognized–and questionably obnoxious– Vegetable Game, contested ownership of a mounted deer between the Mellos and Trombones, and, of course, loving each other like family. For more information on any of these traditions, feel free to approach the Mellophone tailgate on game days and introduce yourself!